This article was published on Dr. Berhanemeskel Segni’s?facebook page on 04 October 2017. Five Major Institutional Losers of Grand Irreecha 2017 Thanksgiving Celebration! Admittedly, I am not good in writing obituary for the losers to nurse their wounds. But, I will list them for our people to notice the obvious; and the international community to take note of the forces of evil and instability who betrayed the Oromo people, half of the Ethiopian population, to destabilize and undermine the equitable, fair and sustainable development of all Ethiopians by institutionalizing policy of discrimination, exclusion and marginalization against the Oromo people. The TPLF/EPRDF is the first and primary loser of the Irreecha 2017 Thanksgiving Festival. TPLF/EPRDF consolidated its hold on power in Ethiopia from early 1990 to the present using the goodwill, human and material resources of the Oromo people. Oromo heroes and heroines helped the TPLF/EPRDF led government of Ethiopia to defeat the Eritreans during the 1998-2000 war between the two countries. Yet, all that the Oromo people got from the TPLF/EPRDF led government in Ethiopia is death, detention, torture, poverty, and aggression by the Somali Janjaweed Militia in recent months. The failure to address a single issue out of over seven policy demands of the Oromo people during the Oromo protests clearly shows the permanent failure of the TPLF/EPRDF political leadership in Ethiopia. 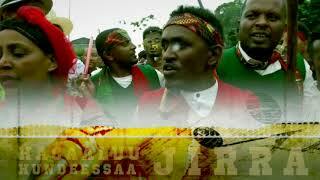 In addition, the decision of the TPLF/EPRDF military, security and police leaders to deploy armed military, security and intelligence forces at the Irreechaa 2017 Thanksgiving Celebrations in violation of the decisions of the Oromo Abbaa Gadaa Council and the Oromia National Government and the will of the Oromo people is a clear testament to the fact that TPLF/EPRDF is clearly against the peace, security and development of the Oromo people. This is a serious problem for the TPLF/EPRDF. I sincerely hope the that TPLF/EPRDF will work to win back the trust and friendship of the Oromo people and work to build bridges between the people they claim to represent and Oromo people instead of destroying the existing ones. 2. The Federal Defense Force, the Federal National Security and the Federal Police! These three federal institutions are losing trust of the Oromo people at a fast pace than any other institutions known to the Oromo people. These three entities are openly designated as the killers, the torturers and robbers of the Oromo people over the last two years of Oromo protests. Their willingness and accomplice nature in assisting the Somali Janjaweed militia to invade over five Oromia Zones and fourteen Woredas and displace and evict close to one million people are unmistakable. At least they did not come to aid of the Oromo people in this time of need when the peace and security of the Oromo people is gravely undermined. In fact these three entities are the direct culprit of the 2016 Irreecha Massacre. Their decision to destabilized Irreecha 2017 by deploying armed federal defense force, federal security and federal police against the will and decision of the Oromo people and their leaders puts these three institutions in serious trouble and gravely undermines its future existence. I hope they will work to regain the trust of the Oromo people. For now, they are the clear losers of Irreecha 2017. 3. Ethiopian Broadcasting Corporation, Fana Broadcasting Corporation and others media outlets. Ethiopian Broadcasting Corporation, Fana Broadcasting Corporation and other non-Oromo media outlets in Ethiopia and outside Ethiopia are proved to be the one of most racist and discriminatory institutions against the Oromo people. None of them cared to cover or even provide their hypocritical lip services by providing coverage to the only Oromo National Holiday, the Irreecha Thanksgiving Celebration. Obviously, they are the most noted racist and losers of all times. The Oromo people need to work to take back most of these institutions that were built by the resources and money secured from Oromia coffee, gold and above all tax money from the Oromo people. All Ethiopian federal institutions were either indifferent or totally lost on all interests of the Oromo people. There are two reasons for this. The first one is Afaan Oromo is not the working language of these entities and they are more distant to the Oromo people than the foreign embassies in Addis Ababa. An Oromo can get Afaan Oromo interpreter at the United States Embassy at the cost of the American Tax payer. Yet, in Ethiopian Federal Institutions including hospitals where live and death situations are decided on the life of an Oromo, an Oromo cannot get any help. Second, due to systemic discrimination, exclusion and racism against the Oromo people, these federal institutions are off limit to all Afaan Oromo speakers. Less than ten percent Amharic speaking Oromos with no political power or agency of the Oromo people are employed in these institutions. The Oromo people must work to overtake these racist institutions that works against the interests of the Oromo people. Obviously, they are the primary losers of the trust of the Oromo people and Irreecha 2017. 5. Big Businesses and Companies based in Oromia and Addis Ababa! These are another group of losers who expect to exist among the Oromo people while hating and despising everything Oromo. None of the Big Businesses and Companies based in Oromia and Addis Ababa cared to sponsor the Grand Irreecha 2017 Thanksgiving Festival events. Coca-Cola, Ethiopian Airlines, Ethiopian Commercial Banks, Sheraton and Hilton Hotel Chains, Ethiopian Insurance, all other Oromia based banks, hotels, retail businesses, manufacturing, mining, all Beer Factories and construction sector businesses are all totally absent. It is important here to note that these companies and businesses are the frontrunners in sponsoring and organizing celebratory events of other none Oromo holidays in Ethiopia. Yet these companies and businesses are expecting to make money on the back of the Oromo people and Oromo resources while hating, discriminating and excluding the Oromo people in their employment, benefit redistribution and community connections. The Oromo people must get organized and incorporate their own businesses that will replace these parasites and lead the Oromo people to prosperity and progress! Thank you for reading. I hope these lists, although not exhaustive, will highlight the winners, heroes and heroines, and the losers of the Irreecha 2017 Thanksgiving Festival. Happy Irreecha Again!